Tim’s Cascade Snacks have been keeping ahead of the curve, tastefully, since 1986. It all started when Tim Kennedy and his family opened a makeshift 15,000 square foot facility in Auburn, stocking it with used equipment and a lot of muscle. The result was the original small batch thick sliced hand spiced potato chips. Not long after Tim’s cult-like following clamored for new flavors and the snack line expanded to Hawaiian Kettle Style Potato chips and Onion Rings and Erin’s All Natural Popcorn. 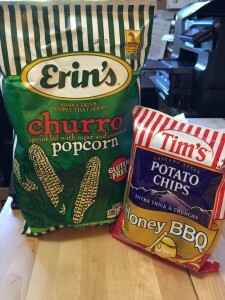 Just in time for the Seattle Wine and Food Experience, Sunday, Feb. 22, Tim has again pushed the potato and corn envelope to introduce Erin’s Churro flavored popcorn and Tim’s Honey BBQ potato chips. The Churro popcorn is sprinkled with just enough sugar and cinnamon to give it a lilt of sweetness without getting in the way of the popcorn goodness. Gluten free, it is made from premium white corn and is a perfect “hands-on” dessert. Tim’s Honey BBQ chips hold true to the company’s line up of premium potatoes direct from family owned farms, sliced thick and kettle cooked before being perfectly seasoned. The real potato flavor is just the introduction to the barbeque flavors of real tomato, onion and garlic…with a special touch of honey. These new flavors will fit in perfectly to Tim’s already lauded line. Accolades of the company’s flavors have come from Esquire Magazine and the American Culinary Institute. Beyond Tim’s great taste, it has been spotlighted as a top company to work for by the Association of Washington Business and the Hitachi Foundation. Stop by the Tim’s Cascade Snacks exhibit at the Seattle Wine and Food Experience to discover this great company and its newest offerings.